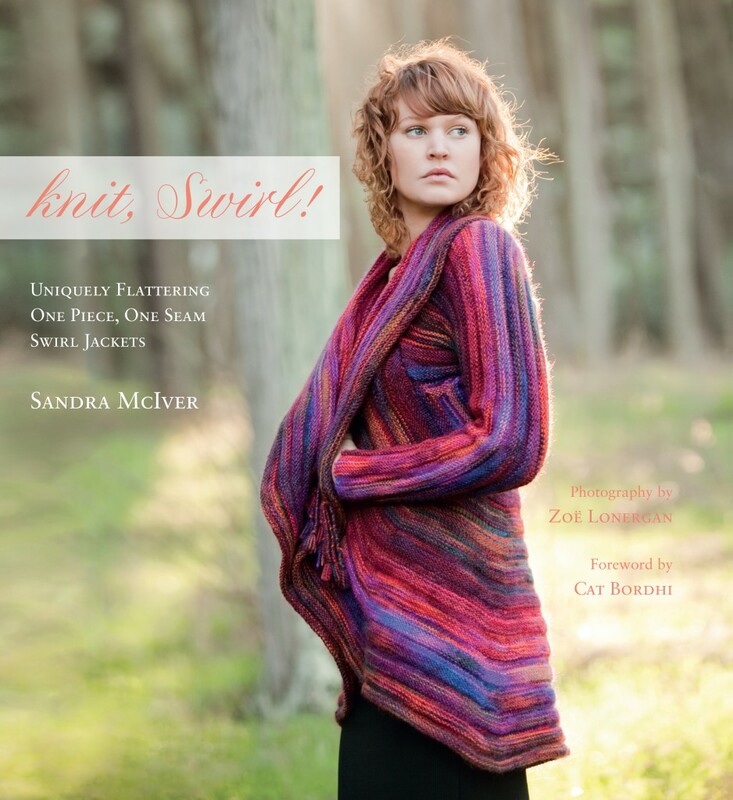 Knitter’s Review on knit, Swirl! I have another approach to picking well-fitting garments. Instead of studying gussets and darts and short-rows, measuring every inch of your body and calculating your shape down to the last stitch and row, just choose something you know will look good. Several years ago at one of Cat Bordhi's visionary retreats, a woman named Sandra McIver told us about a sweater design she had stumbled onto by accident. It was based partly on the popular circular sweaters you often see in shops—but knit with a clever outside-in construction. Sandra wanted to publish a book about these sweaters. Never mind that she'd never published a knitting pattern before. Years ago she conquered the world of wine, founding a winery that would go on to produce some of the finest wines in the industry. With that same confidence, passion, and skill, she turned this sweater into this book. The patterns are all worked from the outside in, beginning with what seems like an absurd number of stitches and getting smaller and faster with each round. Each pattern also has a hexagonal diagram filled with numbers and arrows, accompanied by an equally daunting-looking numeric chart of the sleeve, lapel, and arms. Keep breathing, because they're actually quite clear and intuitive. Perhaps most unusual is the fact that these jackets do not rely on chest, arm length, or any other traditional measurements for their sizing. You simply measure the yoke—she shows how in the book—and choose from among the three possible sizes based on that number. "Reprinted with permission from Knitter's Review, (c) Clara Parkes 2011."